Jupiter, Florida November 11, 2012 – His team had already committed four errors and he’d just watched a one-run lead turn into a one-run deficit entering the bottom of the seventh inning, yet Howard Edwards never panicked. Considering the complexion of the game, who could blame him? For the third, and most important time, the Mid-South Warriors immediately answered Southern Maryland Titan with runs of their own. Stan Wise’s two-out single up the middle scored Wayne Williams with the tying run, before the second Titans infield error of the inning plated Rosario Carrion with the eventual winning run. Jesus Cruz, who tossed an eight-hitter, retired the final six batters in order and Mid-South had survived to win a thrilling 52 American Division MSBL Fall Classic Championship game. The Fall Classic title was the second for Edwards and the Warriors. They beat the Clearwater Pelicans 11-7 to win the 47-and-over division title in 2003 at Al Lang Stadium in St. Petersburg. Some of the current Warrior players, however, had never experienced the thrill of winning a Fall Classic title. Mid-South got to the title game via a 3-2 round-robin record and playoff wins over the DC Express (5-0) and Long Island Yankees (8-6). Billy Hellums was the defensive hero in the semifinal for the Warriors. With two out and the bases full of Yankees late in the game, Hellums made a diving stop and flip to second base for an inning-ending force out saving two ru ns. The defending champion Titans had a much tougher road. Missing key players and barely fielding a team to start the week, Southern Maryland limped to a 1-4 record in round-robin play. Then, with several players back, the team returned to form, blasting the New Jersey Reds, 12-2 and Montgomery County Yankees, 8-2 behind complete-game pitching performances by Bob Englemeyer and Spike Slater. They could have used a little luck, and better hydration awareness, in the sixth inning. Slater was on second base, but called time out because his legs were cramping up. After a prolonged, sometimes theatrical break during which he was rolling around in the outfield grass, shouting at the top of his lungs, and attempting to straighten his leg, he returned to second base only to be immediately and convincingly picked off by Cruz. 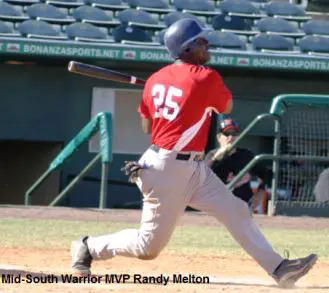 Southern Maryland took an early 1-0 lead when Slater singled to start the game and scored on Frank Watson’s sacrifice fly, but when Melton doubled with two outs and scored on a Fred Banks single, the pattern for the game was set. A third-inning Southern Maryland run was quickly answered with two from Mid-South, before Todd Prescott’s seventh-inning bloop single just beyond second scored Dave Thune and Kelly Jenkins. The play set the stage for the fateful bottom of the inning and paved the way for a Mid-South championship. Eight Mid-South players had hits, with Melton, Williams and Carrion each finishing 1-for-3 and a run scored and Wise going 1-for-2 with a run scored. Slater paced Southern Maryland’s 10-hit attack, going 3-for-4, while Jenkins and Prescott each collected a pair of singles.